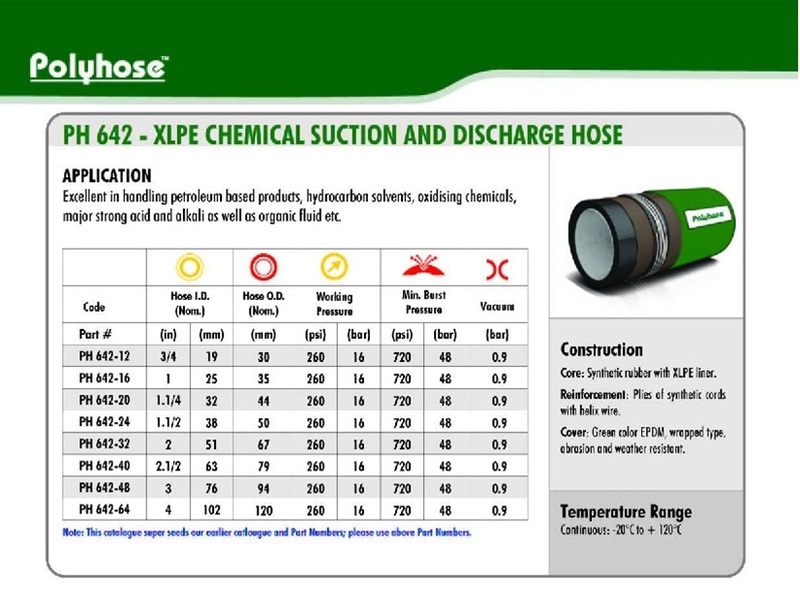 Short Description : LARGE BORE INDUSTRIAL HOSE PH642 XLPE CHEMICAL SUCTION AND DISCHARGE HOSE Application: Excellent in handling petroleum based products, hydrocarbon solvents, oxidising chemicals, major strong acid and alkali as well as organic fluid etc. Construction: Core: Synthetic rubber with XLPE liner. Reinforcement: Plies of synthetic cords with helix wire. Cover: Green color EPDM, wrapped type, abrasion and weather resistant. Temperature Range: Continuous: -20?C to +120?C. Application: Excellent in handling petroleum based products, hydrocarbon solvents, oxidising chemicals, major strong acid and alkali as well as organic fluid etc. Core: Synthetic rubber with XLPE liner. Cover: Green color EPDM, wrapped type, abrasion and weather resistant. Temperature Range: Continuous: -20°C to +120°C.